What should I know about abdominal aortic aneurysms? What is a ruptured abdominal aortic aneurysm? What are the causes of abdominal aortic aneurysms? What size are most abdominal aortic aneurysms? Who gets abdominal aortic aneurysms? Are they genetic? What are risk factors for abdominal aortic aneurysms? What is abdominal aortic aneurysm surgery? What is the nonsurgical management of abdominal aortic aneurysm? What are the complications with an abdominal aortic aneurysm? What is the medical definition of aortic aneurysm? An aneurysm is an abnormal area of localized widening of a blood vessel. The aorta bulges at the site of an aneurysm like a weak spot on a worn tire. Aortic aneurysms are typically spindle-shaped and involve the aorta below the arteries to the kidneys. What is the most common cause of abdominal aortic aneurysm? The most common cause of an aneurysm is arteriosclerosis. Smoking is a major risk factor. What are the symptoms of a leaking aortic aneurysm? Abdominal aortic aneurysms often do not cause symptoms. If they do, they may cause deep boring pain in the lower back or flank. Prominent abdominal pulsations may be present. How do you check for an abdominal aortic aneurysm? X-rays of the abdomen and other radiologic tests including ultrasound, CT, and MRI may be used in diagnosing and monitoring the aneurysm. Rupture of an aortic aneurysm is a catastrophe. Repair of an aneurysm can be done by surgery or endovascular stenting. Picture of grafted stent to repair an abdominal aortic aneurysm. Threatened rupture of abdominal aneurysms is a surgical emergency. Once an aneurysm ruptures, 50% of those with the aneurysm die before they reach the hospital. The longer it takes to get to the operating room, the higher the mortality. An aneurysm is an area of a localized widening (dilation) of a blood vessel. The word "aneurysm" is borrowed from the Greek "aneurysma" meaning "a widening." An aortic aneurysm involves the aorta, the major artery that leaves the heart to supply blood to the body. An aortic aneurysm is a dilation or bulging of the aorta. Aortic aneurysms can develop anywhere along the length of the aorta but the majority are located in the abdominal aorta. Most of these abdominal aneurysms are located below the level of the renal arteries, the vessels that provide blood to the kidneys. Abdominal aortic aneurysms can extend into the iliac arteries. The inside walls of aneurysms are often lined with a blood clot that forms because there is stagnant blood. The wall of an aneurysm is layered, like a piece of plywood. What are the thoracic and abdominal aorta? The aorta is the large artery that exits the heart and delivers blood to the body. It begins at the aortic valve that separates the left ventricle of the heart from the aorta and prevents blood from leaking back into the heart after a contraction, when the heart pumps blood. The various sections of the aorta are named based upon the relation to the heart and the location in the body. Thus, the beginning of the aorta is referred to as the ascending aorta, followed by the arch of the aorta, then the descending aorta. The portion of the aorta that is located in the chest (thorax) is referred to as the thoracic aorta, while the abdominal aorta is located in the abdomen. The abdominal aorta extends from the diaphragm to the mid-abdomen where it splits into the iliac arteries that supply the legs with blood. Most abdominal aortic aneurysms produce no symptoms (they are asymptomatic) and are discovered incidentally when an imaging test of the abdomen (CT scan or ultrasound) is performed. They can also be detected by physical examination when the health care professional feels the abdomen and listens for a bruit, the sound made by turbulent blood flow. Pain is the most common symptom when the aneurysm expands or ruptures. It often begins in the central abdomen and radiates to the back or flank. 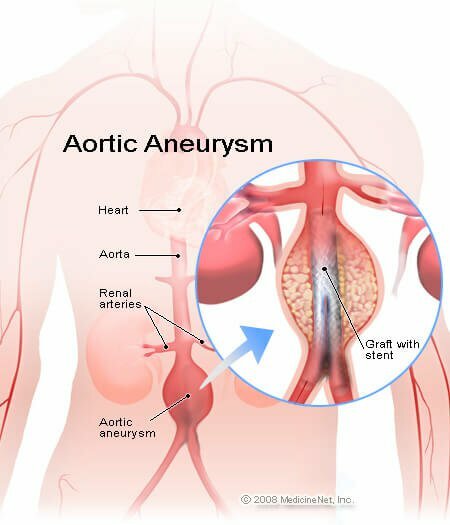 Other symptoms can occur depending upon where the aneurysm is located in the aorta and whether nearby structures are affected. Abdominal aortic aneurysms can remain asymptomatic or produce minimal symptoms for years. However, a rapidly expanding abdominal aneurysm can cause sudden onset of severe, steady, and worsening middle abdominal and back or flank pain. Rupture of an abdominal aortic aneurysm can be catastrophic, even lethal, and is associated with abdominal distension, a pulsating abdominal mass, and shock due to massive blood loss. The most common cause of aortic aneurysms is "hardening of the arteries" called arteriosclerosis. A majority of aortic aneurysms are caused by arteriosclerosis. The arteriosclerosis can weaken the aortic wall and the increased pressure of the blood being pumped through the aorta causes weakness of the inner layer of the aortic wall. The aortic wall has three layers, the tunica adventitia, tunica media, and tunica intima. The layers add strength to the aorta as well as elasticity to tolerate changes in blood pressure. Chronically increased blood pressure causes the media layer to break down and leads to the continuous, slow dilation of the aorta. Genetic/hereditary: Genetics may play a role in developing an aortic aneurysm. The risk of having an aneurysm increases if a first-degree relative also has one. The aneurysm may present at a younger age and is also at a higher risk of rupture. Genetic disease: Ehlers-Danlos syndrome and Marfan syndrome are two connective tissue diseases that are associated with the development of aortic aneurysm. Abnormalities of the connective tissue in the layers of the aortic wall can contribute to weakness in sections of the aorta. Post-trauma: Trauma can injure the aortic wall and cause immediate damage or it may cause an area of weakness that will form an aneurysm over time. Arteritis: Inflammation of blood vessels as occurs in Takayasu disease, giant cell arteritis, and relapsing polychondritis can contribute to aneurysm. Mycotic (fungal) infection: A mycotic or fungal infection may be associated with immunodeficiency, IV drug abuse, syphilis, and heart valve surgery. Most aortic aneurysms are fusiform. They are shaped like a spindle ("fusus" means spindle in Latin) with widening all around the circumference of the aorta. (Saccular aneurysms just involve a portion of the aortic wall with a localized out pocketing). Abdominal aortic aneurysms tend to occur in white males over the age of 60. In the United States, these aneurysms occur in up to 3.0% of the population. Aneurysms start to form at about age 50 and peak at age 80. Women are less likely to have aneurysms than men and African Americans are less likely to have aneurysms than Caucasians. There is a genetic component that predisposes one to developing an aneurysm; the prevalence in someone who has a first-degree relative with the condition can be as high as 25%. Collagen vascular diseases that can weaken the tissues of the aortic walls are also associated with aortic aneurysms. These diseases include Marfan syndrome and Ehlers-Danlos syndrome. Cigarette smoking: This not only increases the risk of developing an abdominal aortic aneurysm, but also increases the risk of aneurysm rupture. Aortic rupture is a life-threatening event where blood escapes the aorta and the patient can quickly bleed to death. Physical examination can be the initial way the diagnosis of abdominal aortic aneurysm is made. The health care professional may be able to feel a pulsatile mass in the center of the abdomen and make the clinical diagnosis. In obese patients with a large girth, physical exam is less helpful. In very thin patients, the aorta can often be seen to pulsate under the skin and this may be a normal finding. Listening with a stethoscope may also reveal a bruit or abnormal sound from turbulence of blood within the aneurysm. In most cases, X-rays of the abdomen show calcium deposits in the aneurysm wall. But plain X-rays of the abdomen cannot determine the size and the extent of the aneurysm. Ultrasonography usually gives a clear picture of the size of an aneurysm. Ultrasound has about 98% accuracy in measuring the size of the aneurysm and is safe and noninvasive. CT scan of the abdomen is highly accurate in determining the size and extent of the aneurysm and its location in the aorta. To help plan repair, if needed, it is important to know whether the aneurysm is above or below where the renal arteries branch off to go to the kidneys and whether the aneurysm extends towards the chest or down into the iliac arteries into the legs. CT scans require dye to be injected to evaluate the blood vessels (including the aorta). People with kidney disease or dye allergies may not be candidates for CT. MRI/MRA (magnetic resonance imaging and arteriography) may be an alternative. An aortogram, an X-ray study where dye is directly injected into the aorta, was the test of choice, but CT and MRI have taken its place. Abdominal aortic aneurysms gradually expand over time. The larger the aneurysm, the greater the risk of rupture and death. Small aneurysms can be observed and followed with repeated ultrasounds or other imaging. A normal aorta measures up to 1.7 cm in a male and 1.5 cm in a female. Aneurysms that are found incidentally or by accident that are less than 3.0 cm do not need to be re-evaluated or followed. Aneurysms measuring 3.0 to 4.0 cm should be rechecked by ultrasound every year to monitor for potential enlargement and dilation. Aneurysms measuring 4.0 to 4.5 cm should be monitored every 6 months by ultrasound. Aneurysms measuring greater than 4.5 cm should be evaluated by a surgeon for potential repair. Each patient is different and the decision to repair an abdominal aortic aneurysm depends upon the size of the aneurysm, the age of the patient, underlying medical conditions, and life expectancy. The first is the traditional surgical approach. A large incision is made in the abdomen, the aortic aneurysm is identified and cut out or resected. The missing piece of aorta is replaced with a synthetic graft. The second approach is placing an endovascular graft. A catheter or tube is threaded into the femoral artery in the groin and the graft is positioned so that it spans and sits inside the aneurysm and protects it from expanding (endovascular: endo = inside + vascular = blood vessel). The approach to treatment needs to be tailored to the individual patient and very much depends upon the location, size, and shape of the aneurysm. Controlling high blood pressure: Beta blocker medications may be used to control both blood pressure and to decrease the pressure within the aneurysm. An aortic aneurysm can leak causing an increase in the patient's abdominal pain. When pain is felt in the back or flank, the symptoms can be misdiagnosed as a kidney stone. If the diagnosis is missed or if the patient does not present for care, the aneurysm can burst or rupture causing potential catastrophe and death. Drugs in the fluoroquinolone class of antibiotics rarely may cause aortic aneurysms to rupture in some people, according to the FDA. Since aneurysms are associated with atherosclerosis and plaque along the aortic wall and since aneurysms often contain a clot, debris can travel, or embolize, into smaller blood vessels and cause symptoms due to decreased blood flow. Aneurysms can rarely become infected. Rahimi, SA, MD. Abominal Aortic Aneurysm." Medscape. Updated: Aug 16, 2017. Svensjö, S., et al. "Low prevalence of abdominal aortic aneurysm among 65-year-old Swedish men indicates a change in the epidemiology of the disease." Circulation 124.10 (2011): 1118-1123.